In 1946, the British rule over the Emirate of Transjordan ended and Jordan became independent. Situated on the Arabian Peninsula, Jordan covers 89,213 sqkm area with Amman as the capital city. 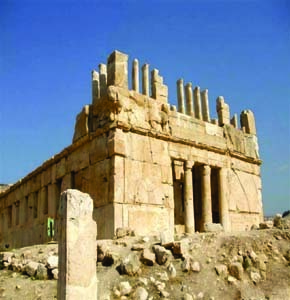 Jordan is a historical country showing several sites of great heritage value. Today many of these sites make big tourist attraction. There are monuments carved out of rocks presenting excellent example of cave architecture. Petra. The ancient city of Jordan is one of the world's archaeological wonders. The city is carved from a mountain of multi coloured sandstone and approached through a narrow but towering gorge. In a naturally fortified position, rich in water, Petra was for centuries the meeting point of the most important routes used by the camel caravans that transported precious cargoes of between the Mediterranean and the Near East, Africa and India. Petra was founded by the Nabataen's, a Semitic population originally from northern Arabia that settled in the region in the eighth century B.C. Once the capital of the Nabataeans this provincial city is now the beating sandstone heart of the Jordanian tourism industry. There are fifty good hotels to meet the requirements of visitors who come to see wonderful Jordan. There they see the Khazneh el-Foroum, also called the Treasure House, which is undoubtedly one of the most impressive works of the art of antiquity. It is an imposing façade standing nearly 40 m tall,cut directly from the rock of the mountainside. The building is in a good shape and presents an elaborate architectural form consisting a portico on the lower floor with six columns, crowned by floral capitals and surmounted by a fronton. The second floor is divided into three parts at the centre with a conical roof, surmounted by an urn, and on either side two half-frontons, supported by columns. The gate of the treasury hammered out of the red sandstone, in a single piece, is magnificent. The Corinthian columns of the Treasure House and depiction of figures spell out the cultural influence of the western culture of the ancient Greeks and Romans on Nabataens. The Treasure House is presumed to be the tomb of a Nabataean king. It is the only rock cut building in Petra which presents absolutely no Nabataean element. Its general design and decoration and the carved reliefs show links with the Alexandrian world and the Hellenistic artistic tradition of the 2nd half of the 1st century B.C. There are other sites in Jordan, which are of big tourist attraction as well as of historical importance from architect's point of view. Located near the old city El Balad is a vast open air theatre, originally chiseled out of the mountain side by the ancient Greeks. Excavations in Umm Ar-Rasas in Jordan have uncovered some of the finest Byzantine Church mosaics, including a large chapel and a large carpet depicting old and new Testament cities on both the east and west banks of the Jordan River. Another feature of Umm Ar-Rasas walled settlement is a 15m Byzantine tower is stone used by early Christian monks seeking solitude. The other place of interest in Jordan is Iraq Al-Amir. It is a historical site built by a Persian Prince in the 3rd century B.C. There are many caves in the hill that date back to the Copper Age. Jordan is surrounded by a mystic aura and attracts visitors with unparalleled beauty and charm.